Sell in May and go away? Not this summer, and not these five stocks. So far this year, the S&P 500 is up just over 5%. That's not a bad run for a broad index like the S&P, but it's nothing compared to the red-hot gains investors have seen in these five stocks. Gold prices have been on an absolute tear so far in 2016, driving the stocks of gold miners like Newmont Mining (NYSE:NEM) to impressive highs. In dollar terms, gold is up about 28% so far this year. Newmont, though, is up a staggering 127% over the same period. This miner was up over 21% in June alone, driven ever higher by the rising price of gold and by investors seeking safety after the U.K. voted to exit the European Union. Newmont rose 10% in just the week following the Brexit vote. 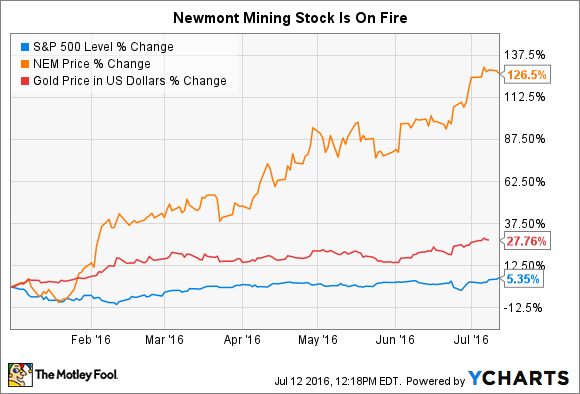 If volatility and uncertainty continue, I think Newmont will stay red-hot. 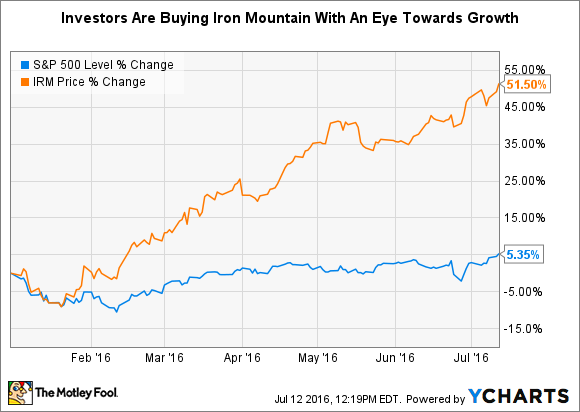 With a name like Iron Mountain's (NYSE:IRM), you may think this stock is also in the mining business. In reality, it couldn't be farther from it. Iron Mountain is a global provider of document and data storage and management services, giving businesses with the ability to safely store and protect their data, regardless of whether that data is digital and in the cloud or housed on tapes, microfilms, paper, or other physical forms. Iron Mountain has increased its annual revenue for 26 consecutive years, and it plans to continue that streak with new strategic initiatives for growth in the emerging markets as well as through new digital opportunities for its existing clients and markets. That growth potential has investors clamoring for shares, sending the stock up 50% so far this year. Like Iron Mountain, the future for NVIDIA Corporation (NASDAQ:NVDA) is also in digital. But then again, so is NVIDIA's past and present. NVIDIA's stock is up 59% year to date, driven by its position as a leader in the graphics cards and chips powering today's cutting-edge technologies. NVIDIA's chips can be found in research labs and early examples of driverless cars, virtual reality, artificial intelligence, and more. 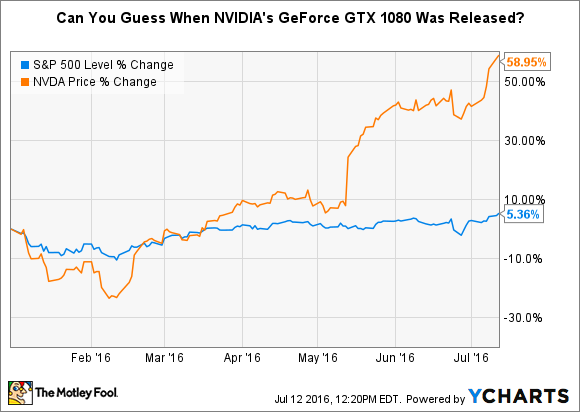 Case in point, the company's GeForce GTX 1080 graphics processor has been consistently sold out at major online sellers since it was first released in June. On secondary markets like eBay, resellers are fetching premium prices 25% or more above retail prices. Investors won't know exactly how the product is doing until the company's next earnings report in August, but the market isn't waiting to find out. The stock is up 46% since the chip was released. NVIDIA's performance is being driven by brand-new, never-before-seen technology. Cincinnati Financial (NASDAQ:CINF), on the other hand, is putting up eye-popping returns in one of the oldest industries around, property and casualty insurance. 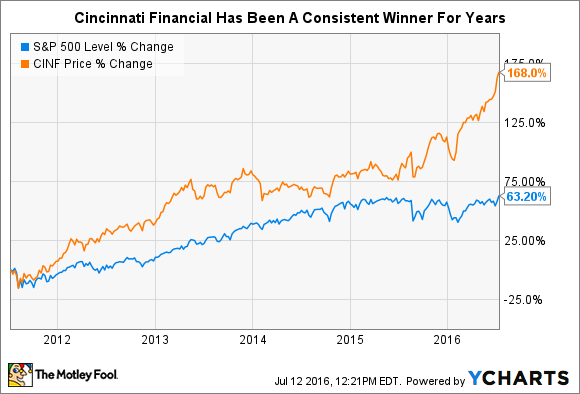 Cincinnati Financial's stock has been a consistent performer since the financial crisis, but it's accelerated that performance in 2016. Over the last five years, its stock outperformed the S&P 500 by a multiple of 2.6. So far in 2016 though, the stock's 28.8% rise beats the S&P by over 5.4 times. The company's first-quarter net income increased 51% compared to the 2015 first quarter, driven by solid revenue gains across all of its business lines, a 1.1% drop in benefits and expenses, and a 6.1% improvement in its combined ratio. Cincinnati Financial isn't reinventing the wheel, but it is executing its business model at an exceptional level. 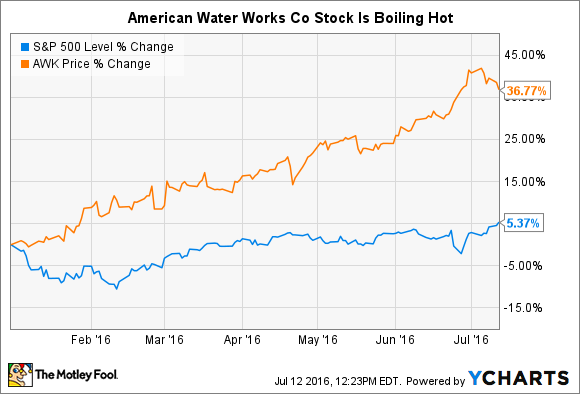 The final hot stock for July is American Water Works Company (NYSE:AWK). American Water Works is a water utility providing services to 1,600 communities in 16 states. Its stock is up 36.7% since Jan. 1. Since the tragic failure of a water utility to provide safe drinking water to residents of Flint, Michigan, private water utilities like American Water Works have come into favor as an alternative to the government operations that failed the citizens of Flint. This trend could lead to new markets and growth opportunities for American Water Works, which, by the way, would operate in those communities as a legal monopoly. That prospect has investors giddy, driving the stock to its high valuation today. These stocks are about as varied as they come, ranging from commodity plays to high technology to a water utility. The one commonality among them, though, is that their stocks are red-hot right now. If the second half of 2016 shapes up to be anything like the first half, it could be a great time to buy them now, while they're hot.